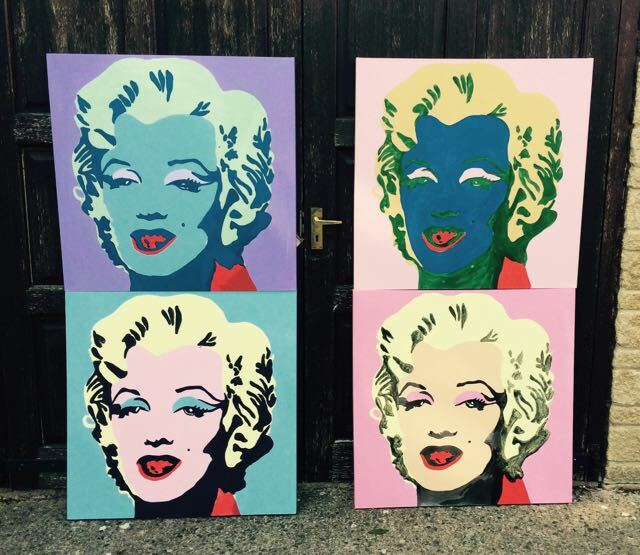 An educational Art Week for very little people…. Although most of the blog tends to be about Crafts & Interiors, I also tutor art to children and paint myself. Last week I was in London to run an Arts Week for 4-7 year olds at a Primary School. They are very small, and there are 3 classes per year group and three year groups. So it worked out to be 270 children over the week, EEK….! Actually it ran very smoothly….! 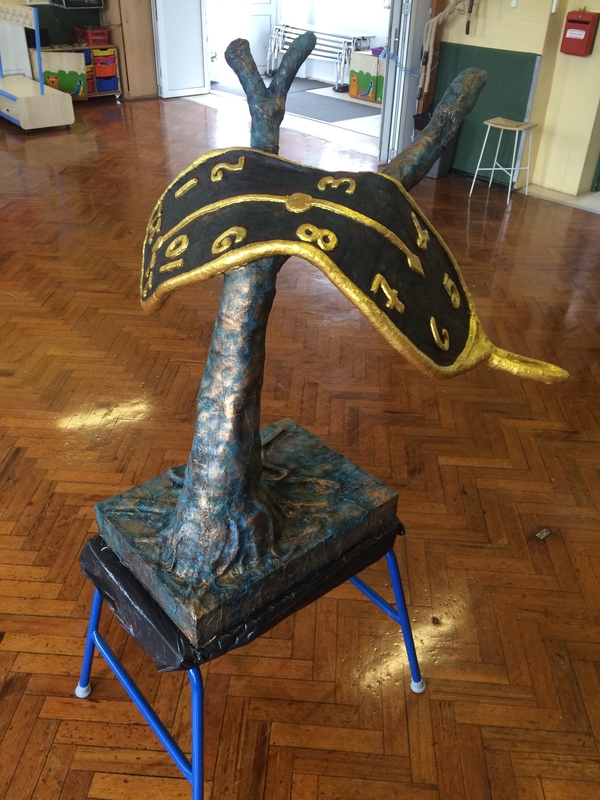 I had been asked to provide large scale works for the school, with each year group basing one on a specific genre of art and helping to make the pieces. Reception Class have Andy Warhol, Year 1 have Salvador Dali and Year 2 have Georges Seurat as their artist to study. 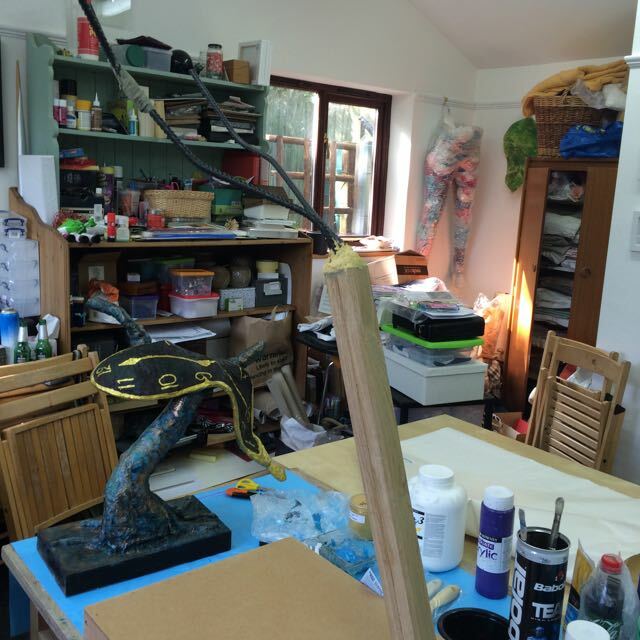 The school want large pieces to have as permanent exhibited pieces, and we will be making them with the children. My partner in crime Marianne and I, who run these weeks through Primary School Art, came up with ideas for large impact pieces. 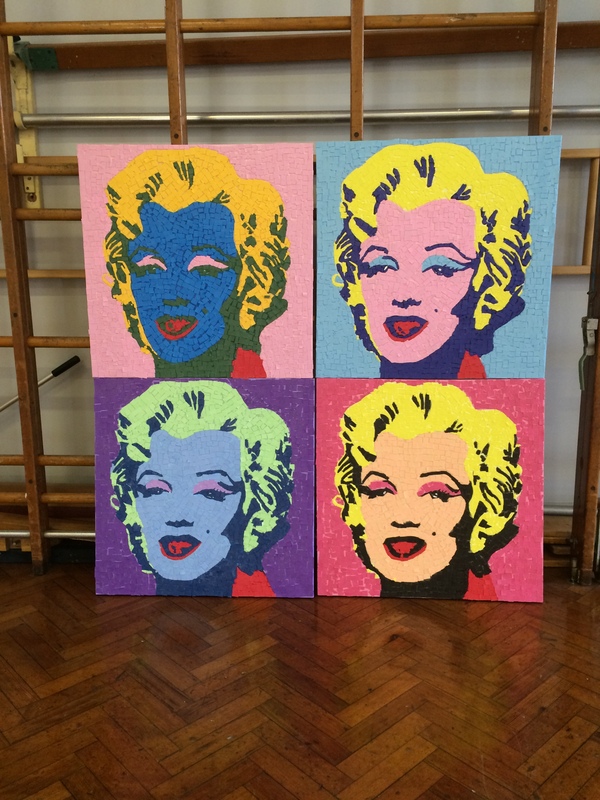 For the tiny ones in Reception we used Marilyn Monroe screen prints by Warhol as the theme, and prepared 4 very large canvases for the children to mosaic using EVA foams and glues. As they are so little, we felt glue and cutting was ambitious enough! 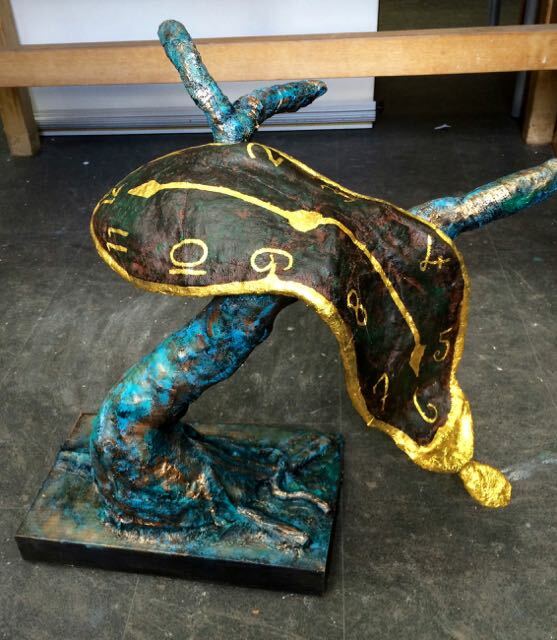 For year 1 we looked at Dali, so rather than do the expected dripping clock painting, we planned a 4 ft sculpture of ‘The Persistence of Memory’ instead. This is using steel, concrete, wood, plaster, plastic wrap, and paint. We made a maquette below of the piece to see how the balance worked with a melting clock at an angle (all OK), and it looked fun, if not challenging, to get it made in 2 days with the little ones. 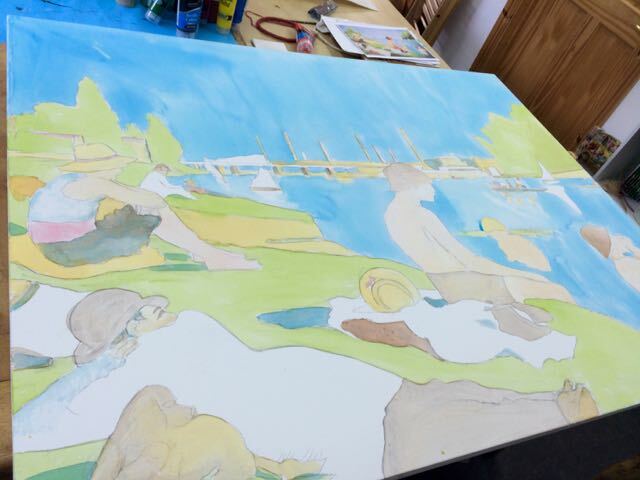 Year 2 are doing Seurat, so we marked up a very large 5ft canvas with the ‘Bathers at Asnieres’, ready for them to get dotting on. 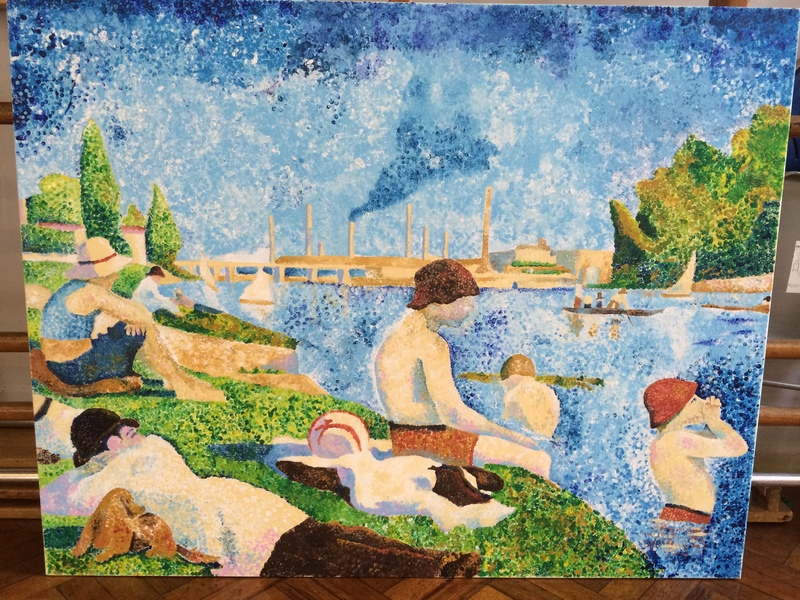 We planned to only be using 3mm diameter dots, and also using Seurat’s method of colouring using adjacent primaries to create new tones.